Rewiring a house can make your heart skip a bit. Homeowners react this way because aside from the high costs, an electrical rewiring project usually means tearing down walls and making a big mess that the exhausted homeowner is left to deal with. Hence, some opt for repair services or using the old, faulty wiring as it is. Of course, this is dangerous and your electrician will advise you against it. Thankfully, there is an alternative to tearing down walls. It is possible to rewire your home without removing the drywall. How? With skill, the right tools, and cost. An experienced electrician can inform you of the process and carry out the rewiring easily. The method used by the electrician is to find a crawlspace to feed the wire through the wall. We have discussed the stages below. After an inspection carried out by the electrician, planning becomes necessary. In this first stage, the electrical technician will require a plan showing or depicting the circuitry of the wires to be removed and another for the replacement. Next, remove the insulation from the wall and locate the crawlspace where most of the work will be done. The breaker should be switched off to remove power from the wires. It isn’t proper to pull the wiring from the wall. They are likely stapled and this will cause the destruction we want to avoid. As a safer alternative method, cut the cable and pull out what you can. Work on the new wiring as a replacement for the parts removed. It is also possible to tape the new to the old wires. Since you won’t be taking the regular technique of pulling down drywall for rewiring, you must ensure the new cables are extra tight or clamped down. 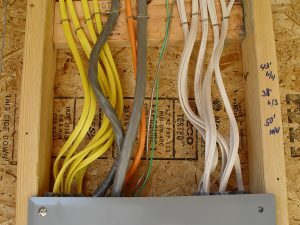 This rewiring technique is usually faster and more efficient as a two-man job, where one person feeds the wire and another catches it to secure the wires. To get this done in your home, hire a skilled electrician with experience on the job. It is often better to consider referrals from people who had similar work done in their home. It is important not to attempt this yourself or hire someone less skilled. You can reach us at The Electric Connection to put an end to your worries and complete this project. Our electrical technicians guarantee a stress-free rewiring for your home. ← How Much Does a Tesla Car Cost?